Weather is suppose to be sunny and in the 50s. Don't forget your green and your kilts (if you have them). We need to be at the staging area by 12:30pm. So we are in 6th division, 2nd. We are behind the Bolivia dancers. Staging area is St. ASaph/Queen St. I had to shell out money for the last parade hotel since the parade canceled too late for me to cancel, so I can't really afford another hotel room. Because of the shorter distance and also less folks, we decided not to book a hotel. We will be doing parking lot changes. There are a few options. I won't have the truck to ferry folks to the staging area. Southside 815 Restaurant has a free parking deck that is generally "warm" even in the winter. It is about .8 miles from the staging zone. We have to be mindful how far of a walk, but we should be ready to go by 12:00/12:10pm. For those who can't walk that far there is a lot closer to the staging area, but you may need to go a little early to get a spot. It's $7. Count me in. I'll decide which costume to go for based on our needs. Time to start making some festive accessories. 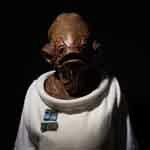 I'm in as Admiral Ackbar. Sign up thread has been posted. Also please review all the new info. Thank you. This year we will be having our post-parade lunch at Joe Theismann’s Restaurant. Due to the size of our group and our desire to have separate checks we will be leveraging a pre-arranged menu consisting of family style appetizers (all 3 served per table) and a single choice of entrée. Checks will be separate so please let your wait staff know if you have multiple checks on one bill. We tentatively have our reservation set for 2:45pm so please attempt to arrive promptly upon the conclusion of the parade. *If you are bringing children they will be able to order off the Children’s Menu based on listed prices. Since this is our first year going to this restaurant lets please try to provide them an accurate count and arrive on time! Parade Day is nearly here! The 2018 St. Patrick’s Day Parade in Alexandria will take place rain or shine! The Ballyshaners appreciate the time and effort that your group puts into appearing in the Parade and we look forward to a wonderful, fun day for all involved. Division Assignment: Your parade unit has been assigned to Division Six (6) of the 2018 St. Patrick’s Day Parade in Alexandria. Please distribute this email and the attachment to members of your unit so they will know where they need to be on Saturday. Staging: Your division will be staged on Alfred Street between Queen and Princess Streets. 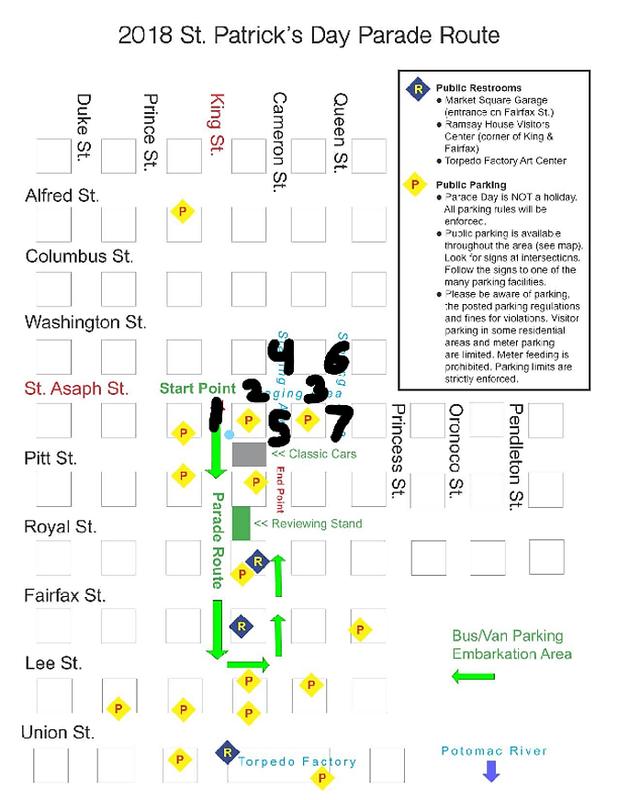 The attached instructions include a map showing the staging area for each Division, as well as a map of the parade route and dispersal area. You will be met at your staging area by Parade Marshals in green vests who will place the units into the correct order for the parade – please follow their instructions! Timing: You should arrive at the staging area for your division between 11:00 AM and 11:45 AM on Saturday, March 3, 2018. Vehicles: If you have a vehicle as part of your unit, identify it as such to the police officers who are controlling access to the staging area. Vehicles which are not part of your unit may not enter the staging area. · NO alcoholic beverages of any kind may be possessed or consumed in the staging area or on the parade route. Possession or consumption of alcoholic beverages in the staging area or on the parade route will result in immediate, automatic dismissal of your unit from the parade. · Units MUST keep pace – make sure to keep up with the unit ahead of you so the parade isn’t full of boring gaps. · There is NO throwing of items allowed. Your marchers may HAND items/leaflets/etc. to spectators, but must not throw anything. · Please clear the dispersal area quickly – bands must stop playing, marchers on foot must move onto sidewalks, and vehicles must leave the dispersal area. Floats must leave the dispersal area prior to dismantling. Thank you again for helping to make this parade great – see you Saturday! New date for the parade. I cleared the spreadsheet so if you were signed up for the old date, please resign up. I'm still getting updated info, so as I know I'll let ya'll know.